High intra-national trade costs prevent market integration, so reducing them can help develop local economies in remote parts of a country. Building transport infrastructure alone is insufficient. The case of Liberia demonstrates that intra-national transport costs remain significant due to high vehicle prices, vehicle repair costs, credit constraints, and corruption. While the costs of international trade have decreased significantly with globalisation, intra-national trade costs remain high in some developing countries. When it is costly for producers to move goods to market, the transport costs drive goods prices higher, which in turn can prevent the economic development of geographically isolated regions. 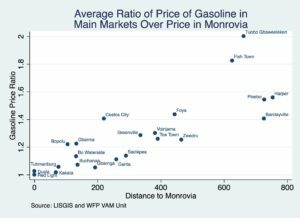 Transport costs in Liberia are so high that gasoline, an imported commodity, was up to twice as expensive in 2015 in remote parts of the country than in Monrovia, the capital city and port of entry (Figure 1). 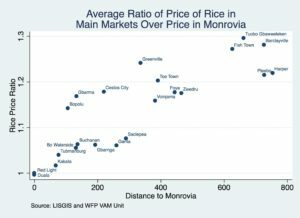 Rice is Liberia’s staple food, another key import, and in 2015 it was nearly 30% more expensive in some areas relative to the capital (Figure 2). Liberia, like many other African economies, is highly dependent on trade. It exports commodities, chiefly natural resources, and imports fuel and consumer goods. Commodities need to be shipped to and from the Monrovia harbour. Affordable transport methods from Monrovia to isolated markets and production areas are therefore crucial for the development of currently isolated provincial economies. 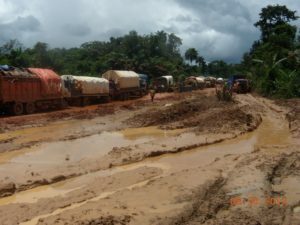 In 2011, the Government of Liberia partnered with the World Bank on a 10-year collaboration to build and maintain a road along the main axis of the country. However, intra-national trade costs remain high, and most markets are still isolated. Why do intra-national trade costs remain so high? 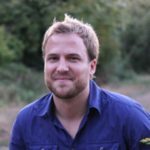 What are the policy implications for the government? To understand the challenges of the transport industry in Liberia, we interviewed more than 70 companies and 200 drivers based in Liberia’s main transport hubs. The most significant challenges the Liberian transport companies report are, in descending order of importance, poor road conditions, vehicle prices, and vehicle maintenance costs. Poor road conditions damage vehicles, and vehicle maintenance costs are a significant share of these firms’ expenditure. In our sample, maintenance costs represent 19% of total expenditure. The high maintenance costs are in part driven by the fact that spare parts are hard to find locally and quite expensive. It costs these firms around US$30,000 to buy a truck, depending on the truck’s attributes. The local truck market is not well developed. Two-thirds of the trucks in our sample are directly imported from United States, China, or Europe by the transport companies themselves. Importing trucks to Liberia entails shipment costs and import taxes. 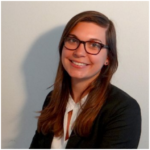 The companies report that used trucks are significantly cheaper than new ones, which helps explain the finding that two-thirds of the trucks imported to Liberia in our sample were bought second-hand. Our sample contains small, family firms with 1 or 2 trucks and large firms with an average of 8 trucks. These large firms are not common in Liberia, representing just a third of the sample. In the small firms, owners usually drive the trucks themselves or hire a family member. These small firms have trouble obtaining credit to expand their businesses. Only 23% of the trucks in our sample are financed through bank loans, and that share falls to 5% among the small firms. Improved access to credit for small firms appears to be a key factor for expanding the supply of transport services. Such credit would not only boost the transport capacity of existing firms but also facilitate the entrance of new firms to the market. Truck drivers report having to pay a bribe every 30 minutes on the road on average, and firms spend as much as 8% of their expenditure on bribes. Bribe amounts vary widely, from cents on the dollar to over US$1,000. Most of the large bribes are paid when drivers are caught overloading their trucks. These bribes raise two issues. First, the firms paying bribes are not held accountable for not complying with the regulation. Second, bribes collected by local officers are not the official penalty collected by the government, so the money is not available to be used for funding better infrastructure. In the case of overloading, the impact of non-compliance is twofold: an overloaded truck is not only damaging to the truck itself but also to the road it is driven on. Fortunately, in 2016 the government scaled up its efforts to control overloading. The “Axle Road Regulation” issued by the Ministry of Transport went into effect in July 2016, limiting the authorised load on the country’s roads. The government also planned the installation of two weigh stations in the country. These regulations, combined with corruption control, may improve the sustainability of Liberia’s infrastructure. Transport companies in Liberia face high marginal costs that prevent them from scaling up their business. Reducing these costs would make smaller firms more competitive, enhance entry to the market, and push down goods prices in isolated areas. An obvious way to facilitate transportation capacity is to develop further infrastructure, but other responses are available. In particular, key areas to address include high truck prices, vehicle maintenance costs, credit constraints for small firms, and bribes. Policy makers should also continue existing efforts to control truck overloading and examine ways to reduce international trade costs related to vehicle and fuel imports.